My husband thinks that I rearrange our furniture every 3-4 months to amuse myself. While I do enjoy moving things around in the house, the main reason I tend to rearrange rooms is to make space for the new things we accumulate. With four people in the house we end up with a lot of new things over the course of the year. Most things I buy second hand, clearanced or up-cycled. Every three or four months I go through the house and donate any items that we no longer use or I can't find in a way to re-purpose. Yesterday I spent the day moving a bookcase out of my kid's room and re-arranging the remaining furniture in their bedroom. Now they have a large play area and I have a bookcase that I will paint and make look like new for the living room. I already found oopsie paint at the home improvement store for 2 dollars. I love oopsie paint, it's a great way to buy high quality paint for very little money. The paint I found was originally 40 dollars, so 2 dollars was a great deal! The best part of rearranging furniture is watching my husband try to figure out where everything has been moved to. It always makes me smile. I have been making a lot of soups and chili the last month due to the cold weather. It has been a very cold winter and when the weather is far below freezing I prefer food that is warm and comforting. Last week I tried a new recipe for Smokey Weeknight Chili from the February 2014 issue of Better Homes and Gardens. It took minutes to make and was really great tasting. I also made my beans from scratch. I made my beans in the crock pot in a big batch and then measured out the equivalent amount of beans (about a cup and a half for a 15 ounce can). This is a very easy recipe to put together. 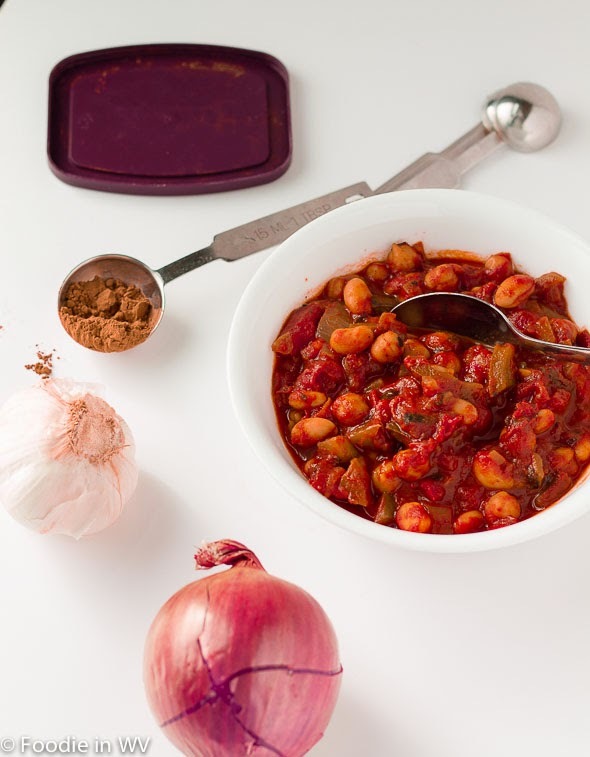 You can substitute black or kidney beans if you don't have chickpeas (or just prefer the taste). It's also an inexpensive meal since it's vegetarian and is even cheaper if you make the beans from scratch. It has 15 grams of protein per serving and only 6 grams of fat so it's a nice all around meal. 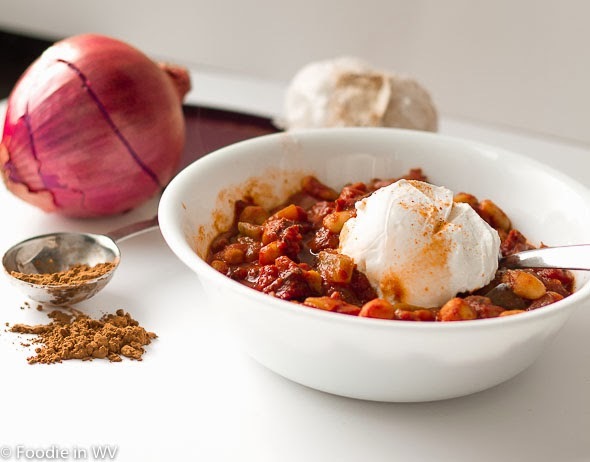 My family liked the chili with a bit of sour cream since my homemade chili powder is a little on the spicier side. For the recipe go to Smokey Weeknight Chili. My house seems to be in a constant state of change also :) Thanks for hosting the hop! Beans from scratch are the best. They're a little more firm, plus you leave a lot of the sodium out, since canned beans contain a lot of sodium. Homemade chili powder is something I need to try. They are a little more firm. I do most of mine in the crockpot so they get softer than when done on the stove. My husband eats black beans for lunch everyday so I make 2 pounds a week in the crockpot. They taste great and so much lower in sodium! The homemade chili powder is really easy and tastes a lot better! So warming and comforting! Have to try your chilli powder recipe. The chili powder is great, I make it about twice a month! I seriously need to go through that donation process at my house. Things are piling up and it's seriously a big mess around here. This sounds really good. I make chili powder sometimes too, and it's much better homemade. It really is much better homemade, I agree! Oopise paint is the best! We have three different stores that do it around here so I always look around for the right color. It saves a lot of money on bookcases etc. The chili powder is really good, if you want it less spicy for your kids just adjust the amount of ancho. Nice. Fast and homemade is so the way to go. I agree fast and homemade is the way to go, especially during the week! The beans are great in this dish and make for a very easy meal!